ALERT: Before you purchase, check with your instructor or review your course syllabus to ensure that you select the correct ISBN. Several versions of Pearson's MyLab & Mastering products exist for each title, including customized versions for individual schools, and registrations are not transferable. In addition, you may need a CourseID, provided by your instructor, to register for and use Pearson's MyLab & Mastering products. Packages Access codes for Pearson's MyLab & Mastering products may not be included when purchasing or renting from companies other than Pearson; check with the seller before completing your purchase. Used or rental books If you rent or purchase a used book with an access code, the access code may have been redeemed previously and you may have to purchase a new access code. Access codes Access codes that are purchased from sellers other than Pearson carry a higher risk of being either the wrong ISBN or a previously redeemed code. Check with the seller prior to purchase. 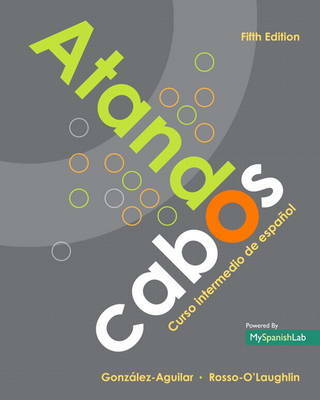 --Understanding that students enter the Intermediate Spanish course at different levels, Atando cabos brings students to a common proficiency level and "ties up the loose ends" from their first year of Spanish. Focusing on the significance of culture and interpersonal communication in learning a foreign language, this text is comprised of high-interest, relevant themes that motivate critical thinking and classroom discussions. Concentrating on the development of basic skills-listening, speaking, reading and writing, with an equal emphasis on fluency and accuracy-this text teaches students to express, interpret, and negotiate meaning in context while learning to analyze, compare, contrast, and understand Hispanic cultures.